Thank you to all equity members who voted in this past election. Our current board members have been reelected and they will continue to a great job for the club. Thank you to Jerry Case for his almost 10 years of service on our Board. I would like to welcome Chris Trentine as our newest Board member. I would like to take this opportunity to invite All members to our annual Meeting on March 21st at 6pm This is an opportunity to meet your newly appointed officers, here the status of the club & have a brief overview of the past year. Immediately following our annual meeting there will be a member appreciation party. This will be a members only event. Now that it is high season, I strongly recommend that all members make dinner reservations at least 24 to 48 hours in advance. 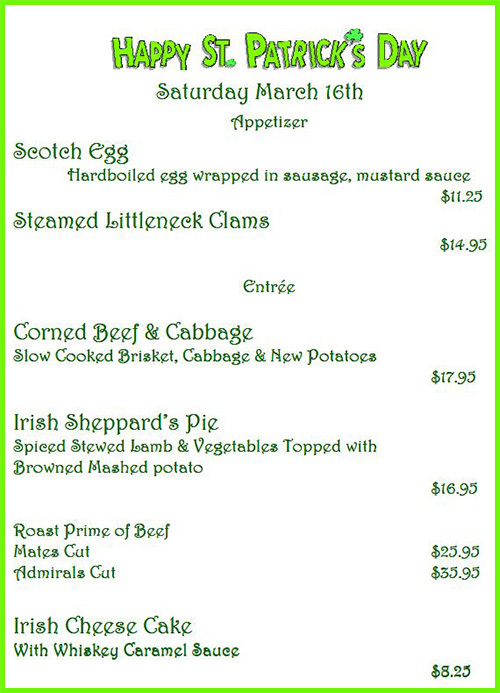 Please remember that we have limited window tables available & they are filled on a first come first serve basis. With our incredibly gorgeous weather, I encourage you to try our outdoor patio. We will gratefully accept last minute reservations with time and space availability being considered. Please be considerate to your fellow members & make sure to have your parking/name card on your dashboard when you come to the club and park 3 deep pulling all the way forward. If you need a new name tag to put on your dashboard, please see Marguarite. Season is in full swing in Islamorada & here at the Club as well. I would like to encourage all members to make your Dinner reservations a minimum of 24 to 48 hours in advance. We will gratefully accept last minute reservations with time and space availability being considered. Members wishing to make arrangements for a private party or special event should contact me at the Club. Ballots for the annual elections have been mailed. Please be sure to mail yours back to the club on or before February 21st. the club on or before February 21st. Please be considerate to your fellow members & make sure to have your parking/name card on your dashboard when you come to the club and park 3 deep pulling all the way forward. On behalf of the Board of Directors, I am pleased to announce that we are under contract for the purchase of additional property on Madeira Road within walking distance from the Club. As everyone knows, parking has been of concern for quite some time. We have been extremely fortunate through the years to have great neighbors and supportive members, the Lindback Family, who have been gracious enough to work with us for overflow parking. 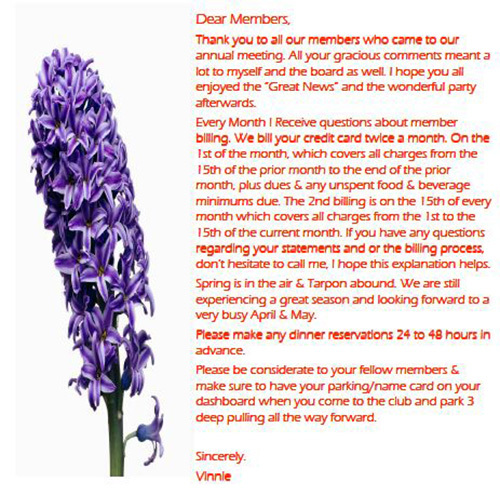 For some time, we had an arrangement with Vernis and Bowling to use their back lot just 400 feet from our entrance but due to their insurance carrier's concerns we were unable to continue using that lot. plans to enhance our facility. Upon closing the transaction, of which our board member Patty Stanley, acting as our realtor, has generously donated her portion of the commission towards our closing costs, we will work to come up with an effective plan to use the property to alleviate many of our parking issues. I am truly excited about this opportunity as I know many of our members will be too. I hope everyone had a wonderful holiday season!!! I hope everyone had a wonderful holiday season!!! Now that season is here and with the Holidays Now that season is here and with the Holidays behind us, we can all look forward to a Healthy, Happy and Prosperous New Year. I would like to encourage all members to make your Dinner reservations at least 24 to 48 hours in advance. Please remember that we have limited window tables available. We will gratefully accept last minute reservations with time and space availability being considered. Please be considerate to your fellow members & make sure to have your parking/name card on your dashboard when you come to the club and park 3 deep pulling all the way forward. The Staff and I would like to take this opportunity to thank the many members for their generous contributions towards our Christmas Bonus Pool. Your generosity is always much appreciated. always much appreciated. It has been our pleasure to have served you this past year. $25,000.00 -- Winner Takes All!!! Don’t miss your chance to win up to $25,000.00 in prize money! The Islamorada Fishing Club Captain's Cup Sailfish Tournament kicks off on January 23rd with fishing on January 24th. This is the second leg of the Gold Cup series and space is filling rapidly. So grab your fishing buddy and sign up today. This one day all release sailfish tournament is limited to 30 boats. With a full field the prize money may be increased to $30,000.00. The tournament entry fee is $2,500.00 and $300.00 for a 3rd angler and includes 3 social tickets for each night. Don’t miss out! Call the Club to enter today! It is December and we are finally having temperatures get into the 50's here in the Keys. This has been a very warm fall for us this year! I realize that the rest of the country has had some early winter conditions already, but the cold fronts just haven't pushed through south Florida until now. Hopefully this cold snap will help improve the winter fishery that we usually have here in the Keys (like sailfish, wahoo, cobia, and grouper). The cold fronts make the biggest difference in the movement of bait fish. With the drop in water temperature, the bait fish will tend to seek the warmer waters near the reef. With these huge schools of bait showing up on the top of the reef, it is only a matter of time for the predator fish to show up to feed. Due to large schools of ballyhoo showing up, we have already had some exciting showering action this fall which had produced some great sailfish catches. I predict that after a few more cold snaps, the bait showers will only get better and better. The best way to target the sailfish, tuna, and dolphin in these showers is to use a light spinning rod with a 30lb. leader. On the Conetagioius, we prefer a 3/0 circle hook and a live ballyhoo or pilchard as bait. Once you get near the shower, simply cast the bait as far as you can in the direction of the shower. The healthier the live bait, the better! The sailfish often want the bait to try and get away. It is kind of like a game of "cat and mouse" to them. Running bait showers can be one of the most exhilarating ways to target sailfish anywhere in the world. You also have a good chance of catching other species in the showers as well. My neighbor caught an African pompano this week casting into a shower! I have had numerous mutton snappers and groupers eat a live bait in a shower over the years. This fall we've had several great days catching some nice blackfin tuna and dolphin showering ballyhoo. The offshore fishing was been very good the past few weeks. Maybe it will continue over the next month with a little luck! The weed and current edges are the key to having a productive day this time of year. We have had some great catches of dolphin and wahoo on magical pieces of debris found along the current edges this past month. Earlier this fall, we were offshore running up a weed edge looking for a piece of debris for mahi when I spotted a blue marlin tailing down the weed edge. With the help of quick thinking on my mate Daniel's part, we were hooked up to a 400 lb blue marlin. It turned out to be an epic battle and we got to see an amazing show while we battled it on the 30 lb spinning rod. You just never know what you will encounter out there so be prepared Over the past few weeks, the blackfin tuna fishing has been surprisingly better than usual for the early winter. The sharks are not such a problem now that the water temperatures are dropping. We all know how frustrating the humps can be when the sharks are bad. The bait of choice lately has been belly-hooked cigar minnows or pilchards. Live ballyhoo will work quite well too. Those same light spinning rods with 20-30lb leader and a 3/0 circle hook will also do the trick on the tuna. Don't be surprised if you get cut off. It could be a barracuda or maybe a wahoo. So, maybe have a spinning rod with a trace of wire ready to go. Speaking of wahoo... they're becoming one of my favorite fish to target in the winter months. We have put in a good amount of time in last year wahoo-trolling and did pretty well. There were several days where we had multiple hook-ups. This year has started off a little slower, but maybe I was anxious and started targeting them to soon. The water this year hasn't been as clear blue as it was last year either. In my opinion, that is the single biggest factor in doing well for wahoo. If you see deep purple-blue water, then there is a good chance that you will have a shot or two at a wahoo. We like to troll cigar leads with a lure trailing about 20-30 ft behind. Our best speed seem to be from 12-17 mph here in the Keys. The best depth for us has been from 120 - 200 feet. The wahoo are also a blast on light spinning rods with live bait. Large speedos or cigar minnows seem to work best. I hope everyone has a wonderful holiday season. If you are stumped on a present for a loved one, consider a fishing charter! They not only will love it, but the boat crew will appreciate the business. Our industry has gone through a lot with the storms over the past few years. And, you never know, maybe it will be the trip of a lifetime! 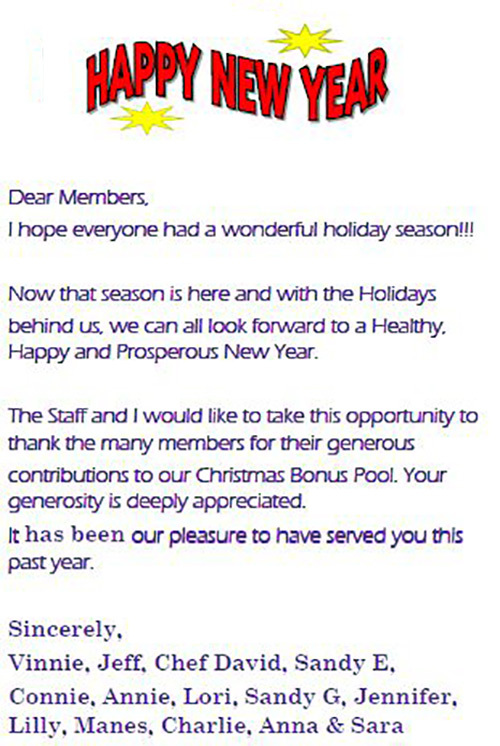 The Holiday Season is here again and part of the tradition of our great Club is to show our trusted employees our appreciation by contributing toward the Holiday bonus pool. In this edition of Shortcast, you will find an enclosed bonus slip that allows you to show your appreciation to our 14 hard working employees. We will also have slips available in the Club. Thank you all for being so generous to our employees. They appreciate it! I wish you and yours a happy, safe and healthy holiday. The Holidays are right around the corner. 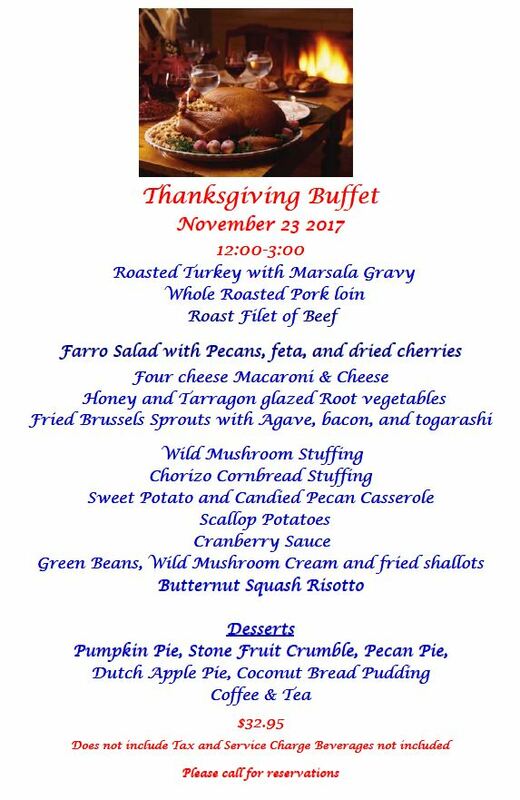 We will be open this Thanksgiving with a bounty of delectable offerings from 12:00 pm to 3:00 pm so please call us with your reservation. Don’t forget The Islamorada Fishing Club for your holiday party Please contact us to reserve your date and time for your family or company event. 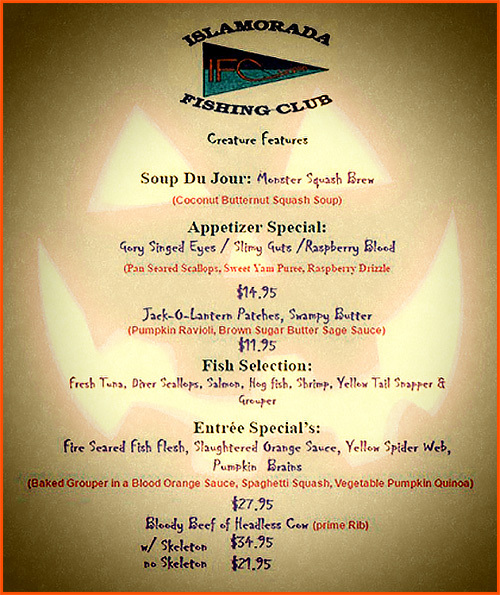 Carve your very own scary pumpkin and bring it to the club the week of October 22nd! Make sure to dress up in your creepiest, scariest or just plain fun costume! Each pumpkin will be judged by the IFC staff & the winners announced on Friday October 26th! The club is re The club is re-opened, and we are anxiously opened, and we are anxiously awaiting the return of all the snowbirds. awaiting the return of all the snowbirds. 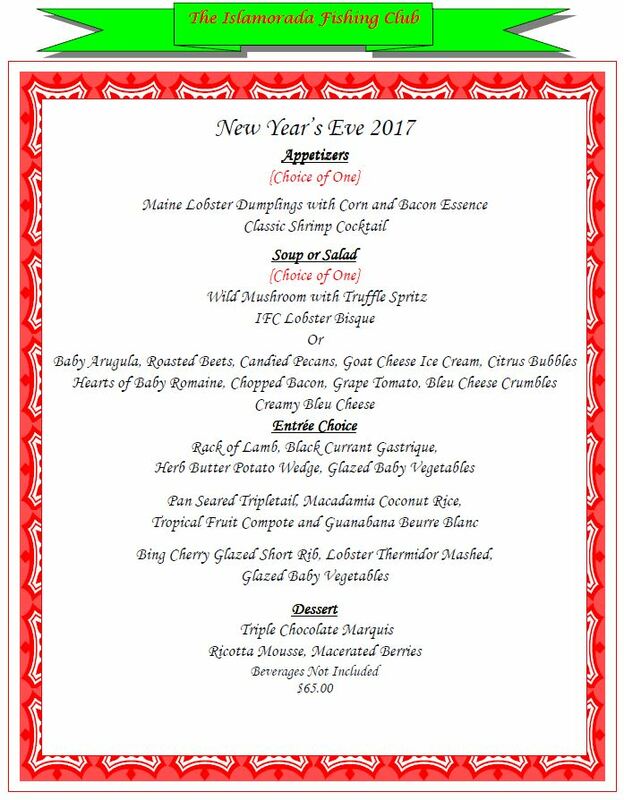 I would like to take this time to remind everyone that we strongly encourage members to make your dining room reservations 24- reservations 24-48 hours in advance 48 hours in advance, and to notify the club promptly of any cancellations or changes to your reservation. cancellations or changes to your reservation. The Holiday Season will soon be upon us Start Planning your Holiday Parties early to secure availability at the club. to secure availability at the club. Please be sure to place your name placard in the windshield and pull all the way forwardwhen visiting the club . This will make it a lot easier to get a car moved. If you need a Placard, please ask, we have a lot!!! Summer is in full swing, we can certainly feel it with the extreme heat. This is the time of year when a lot of you go to your summer homes or go away on vacation. Let’s not forget about your club, especially if you have friends or family coming to visit. They are always welcome to use the club as your guests, even in your absence. Just call me and make a reservation For them, they can pay their own way or charge to your account, either way, what they spend will go towards your annual Food & Beverage minimum. Please inform me when you get a new credit card whether it was lost or it has a new expiration date. Well the summer months are here, and the tournament season has kicked off, I would like to thank everyone for your understanding during our club closures for these tournaments. This is the time of year, when bonefish, tarpon and dolphin fishing are at their best. Please remember to pull all the way forward when parking at the club, and put you name placard on your dash board. I would like to encourage all members to make your dinner reservations a minimum of 24 to 48 hours in advance. Members wishing to make arrangements for a private party or special event should contact me at the Club. Well it’s that time of year again when we say our, "See you in November's". The staff and I would like to say to all of those returning to their summer destinations. Thank you for your support this season. We thoroughly enjoyed seeing and serving all of you, and look forward to your return. With the Spring time weather now upon us we can look forward to those longer days, warmer waters and plenty of good spring Fishing!!! As a friendly reminder I would like to ask all members to please remember to put your IFC "Name Tag" on your car dashboard and pull as far forward as possible when at the club. If you don’t have a tag please see me and I will be happy to give you a new one. Every month I receive questions about member billing. We bill your credit card twice a month. On the 1st of the month, which covers all charges from the 15th of the prior month to the end of the prior month, plus dues & any unspent food & beverage minimums due. The 2nd billing is on the 15th of every month which covers all charges from the 1st to the 15th of the current month. If you have any questions regarding your statements and or the billing process, don’t hesitate to call me, I hope this explanation helps. Spring is in the air & tarpon abound. We are still experiencing a great season and looking forward to a very busy April & May. very busy April & May. Please make any dinner reservations 24 to 48 hours in advance. Please be considerate to your fellow members & make sure to have your parking/name card on your dashboard when you come to the club and park 3 deep pulling all the way forward. deep pulling all the way forward. Thank you to all equity members who voted in this past election. Our current board members have been reelected and they will continue to a great job for the club. 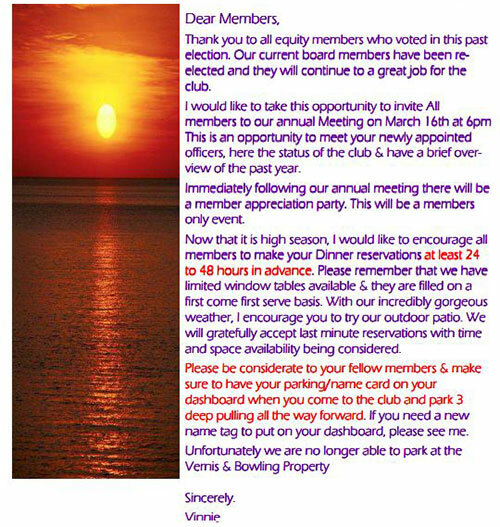 I would like to take this opportunity to invite all members to our Annual Meeting on March 15th at 6:00 pm. This is an opportunity to meet your newly appointed officers, here the status of the club & have a brief overview of the past year. Now that it is high season, and with fewer dining choices available since the storm I would recommend that all members make dinner reservations at least 24 to 48 hours in advance. Please remember that we have limited window tables available and they are filled on a first come first serve basis. With our incredibly gorgeous weather, I encourage you to try our outdoor patio. We will gratefully accept last minute reservations with time and space availability being considered. Please be considerate to your fellow members & make sure to have your parking/name card on your dashboard when you come to the club and park 3 deep pulling all the way forward. If you need a new name tag to put on your dashboard, please see me. Unfortunately we are no longer able to park at the Vernis & Bowling property. Season is in full swing in Islamorada & here at the Club as well. I would like to encourage all members to make your Dinner reservations a minimum of 24 to 48 hours in advance. We will gratefully accept last minute reservations with time and space availability being considered. Members wishing to make arrangements for a private party or special event should contact me @ the Club. Ballots for the annual elections have been mailed. Please be sure to mail yours back tothe club on or before February 15th. I hope everyone had a wonderful holiday season!!! Now that season is here and with the Holidays behind us, we can all look forward to a Healthy, Happy and Prosperous New Year. The staff and I would like to take this opportunity to thank the many members for their generous contributions to our Christmas Bonus Pool. Your generosity is deeply appreciated. It has been our pleasure to have served you this past year. Don’t miss your chance to win up to $25,000.00 in prize money! The Islamorada Fishing Clubs Sailfish Tournament kicks off on January 24th with fishing on January 25th. This is the final leg of the Gold Cup series and space is filling rapidly. So grab your fishing buddy and sign up today. This one day all release sailfish tournament is limited to 30 boats. With a full field the prize money may be increased to $30,000.00. The tournament entry fee is $2,500.00 and $250.00 for a 3rd angler and includes 3 social tickets for each night. Don’t miss out! Call the Club to enter today at 305-664-4735. 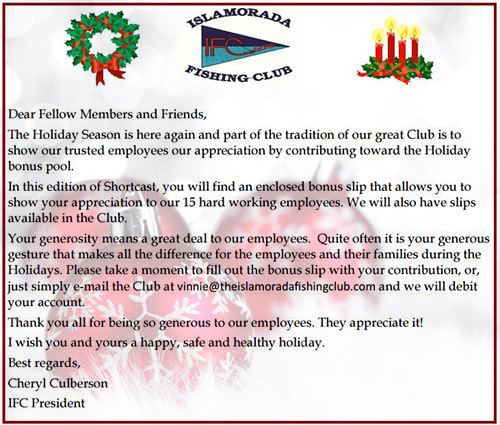 In this edition of the Shortcast, you will find an enclosed bonus slip that allows you to show your appreciation to our 15 hard working employees. We will also have slips available in the Club. Your generosity means a great deal to our employees. Quite often it is your generous gesture that makes all the difference for the employees and their families during the Holidays. 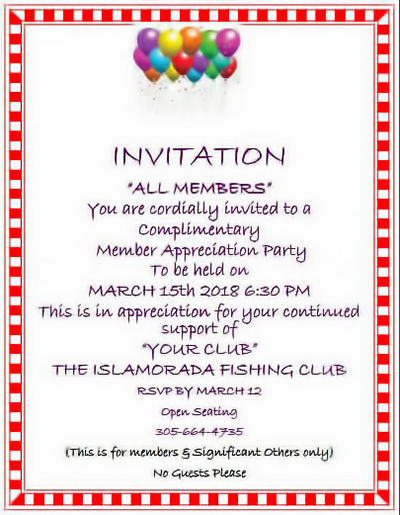 Please take a moment to fill out the bonus slip with your contribution, or, just simply e-mail the Club at: vinnie@theislamoradaﬁshingclub.com and we will debit your account. As the weather turns chilly up north we welcome back our members to the sunny days and cool nights in Islamorada. I know it has been somewhat of a shock to some of you as you return. We have weathered many storms in the Keys, and this will only make us all stronger and more resilient. I wanted to thank each and everyone of the IFC members for extending their concerns not just for the condition of the club, but for the genuine heartfelt concern for myself and the staff. The Holidays are right around the corner. We will be open this Thanksgiving with a bounty of delectable offerings from 12:00 pm to 3:00 pm so please call us with your reservation. Don’t forget The Islamorada Fishing Club for your holiday party Please contact us to reserve your date and time for your family or company event. I would like to take this time to remind everyone that we strongly Recommend that all members make your dining room reservations 24 to 48 hours in advance, and to notify the club promptly of any cancellations or changes to your reservation. Reservations will be gratefully accepted at the last minute, subject to availability. We also encourage members to reserve your cut for our “Prime Rib Night” every Saturday. It is especially important when making reservations for your guests /potential members to phone in their reservation, inform the club of your guests first and last names and if they will be paying or signing to your account. This will insure proper credit towards your minimums. Please be sure to have your name placard on your car dashboard & pull all the way forward while parking. The Islamorada Fishing Club is open for business! I wanted to take this time to express on behalf of the staff and myself a heartfelt Thank You to all our IFC members who took the time to call and write e-mails with their concerns, for not only the condition of the club but for all of us personally during hurricane Irma. The absence of communication during and after the storm was due to us not having internet or phone services until this Wednesday. Just to bring you up to date. Fortunately our club was not heavily impacted from the storm with the exception of our fences down and some debris and We were able to get most of our maintenance projects completed as scheduled during our annual closure. We hope that you’ll were safe and your properties were undamaged. We look forward to seeing everyone upon your return. Due to pending storm “Irma” and the mandatory evacuation, the club will be closed till further notice. We hope all of you have secured your properties and have moved to a safe location. We look forward to seeing everyone when we re-open. September 17th is fast approaching for our annual closing for general maintenance and capital improvements. Our last dinner service will be Saturday, September 16th and we will re-open Tuesday, October 10th. The last few years we were very busy with interior, exterior and overall club improvements. We will be doing some minor repairs, cleaning and organizing this year. Although our staff will be on vacation, I will available to you during the week of October 2nd should you need anything. As we get closer to the upcoming season, please think of the club first for any special events you may be planning. Summer is in full swing, we can certainly feel it with the extreme heat. This is the time of year when a lot of you go to your summer homes or go away on vacation. Let’s not forget about your club, especially if you have friends or family coming to visit. They are always welcome to use the club as your guests, even in your absence. Just call me and make a reservation For them, they can pay their own way or charge to your account, either way, what they spend will go towards your annual Food & Beverage minimum. Please inform me when you get a new credit card whether it was lost or it has a new expiration date. Recently I have had a lot of guests walk in the club saying they are friends of “John Q” member. 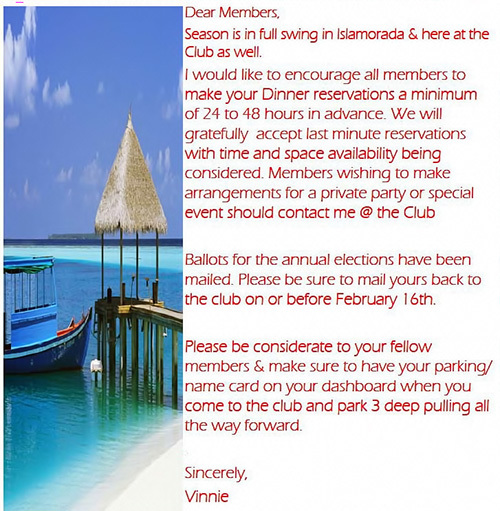 It is club policy that reservations for all guests, must be called in advance by the sponsoring member themselves. Please keep in mind that although we do encourage you to send your guests to enjoy the club and even though I may know some of these guests from previous visits, it would be greatly appreciated if all members would adhere to this policy so all parties can avoid a potentially embarrassing situation. Thank you for your cooperation with this important matter. 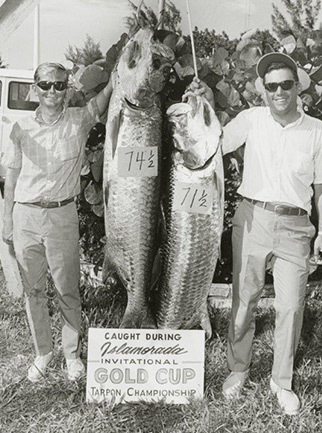 As most of you know June is Tarpon Tournament Season and because of the history of our club, we are Host to many of these prestigious tournaments. We are very proud to host these tournaments and be an integral part of maintaining the history and integrity of tournaments past. Due to this busy time of year, we wanted to inform you of the upcoming club closures for the month of June. I would like to thank everyone for your understanding during our club closures for these tournaments. Please see the attached calendar and the dates listed below. Please keep in mind that I will also send out reminders and any updates prior to the actual closure. I would like to encourage all members to make your dinner reservations a minimum of 24 to 48 hours in advance. Members wishing to make arrangements for a private party or special event should contact me @ the club. Please join BTT on March 30th, 2017 for the 4th Annual BTT Florida Keys Habitat Fundraiser at The Islander Resort in Islamorada, FL. 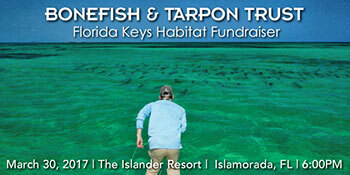 The event will benefit the George Hommell Jr. Florida Keys Habitat Fund which supports BTT's work in the Florida Keys. Enjoy drinks, BBQ, and live music from The Carousers. The evening will also feature a short presentation from Dr. Aaron Adams, Director of Science and Conservation for Bonefish & Tarpon Trust. Make sure to sign up as soon as possible as there are only a limited number of spaces available, and this one of a kind event is sure to fill up very quickly! BTT is proud to support the Guides Trust Foundation by donating a portion of the proceeds from the evening's silent auction. $10,000 Silver King Sponsor- Includes name on program and materials, verbal recognition during program, Orvis Helios 2 fly rod and Mirage Reel, and a prime table of 10 premium event tickets. Florida Bay Forever will serve as grand marshals on December 2 in the Islamorada Holiday Parade. This year's parade theme is "Rockin’ Around the Florida Bay." Florida Bay Forever is a grass roots registered nonprofit unifying the voice of Monroe County to advocate to preserve the Florida Bay. FBFVR advocates for buying land south of the lake in order to store and clean water that can get to the Bay. The parade, part of the Chamber's 12th Annual Islamorada Holiday Festival, will begin at 7 p.m. that Friday evening in Founders Park. Florida Bay Forever will lead participants around a route that circles the park's Great Lawn, giving observers plenty of space and many great vantage points from which to view the action. Sign-up for the parade remains open. Participants should design their entries in accordance with the "Rockin' Around the Florida Bay" theme. Bands, antique car groups, scout troops, churches, businesses and other organizations or individuals who are interested are encouraged to enter. Judges will select winners in several categories based on creativity and adherence to theme. In addition to the parade, Holiday Festival features visits and photos with Santa, a 30-ton snow mountain, a 35-foot tree blowing magical snow from its branches, the Holiday Gift Bazaar, delicious food and beverages, continuous live holiday stage performances, and returning for a third year, scrumptious desserts and coffee at Santa’s Sweet Shoppe. To register for the parade, please stop by the Islamorada Chamber of Commerce Visitors Center at the entrance to Founders Park, or call 305-664-4503 and ask for a registration form. As the weather turns chilly up north we welcome back our members to the sunny days and cool nights in Islamorada. I would like to take this time to remind everyone that we strongly Recommend that all members make your dining room reservations 24 to 48 hours in advance, and to notify the club promptly of any cancellations or changes to your reservation. Reservations will be gratefully accepted at the last minute, subject to availability. We also encourage members to reserve your cut for our “Prime Rib Night” every Saturday. It is especially important when making reservations for your guests/potential members to phone in their reservation, inform the club of your guests first and last names and if they will be paying or signing to your account. This will insure proper credit towards your minimums. Please Be sure to have your name placard on your car dashboard & pull all the way forward while parking. As most of you know by now, my son Vincent was diagnosed with high functioning autism at the age of 3. Vincent has been the recipient of a scholarship from Island Dolphin Care in Key Largo the past 7 years. The Island Dolphin Care scholarship has provided classroom therapy and supervised dolphin swims for 1 week every afternoon for Vincent, now 14 years old. His response to this program is always incredible and very uplifting!!! They are a wonderful not for profit organization run by Deena & Peter Hoagland and an incredibly dedicated staff of therapists, dolphin trainers and interns. On November 19th they are holding their annual fundraiser dinner/auction to raise funds to assist children & families with special needs, and Veterans & Military personnel. Your participation would mean a great deal to Vincent, Mia and I. If you would like more information feel free to contact me. Happy summer everyone! We hope you are enjoying your summer, wherever you may be! We are happy to announce that we have a new chef, David Dotero, who comes to us from Morada Bay. David has an exceptional culinary background and a passion for his profession that is reflected in his cuisine and his demeanor. Please help welcome him on your next visit. We look forward to seeing you at the IFC. Look for next year’s IFC Snook and Redfish Smack Down coming in October 2016! Enter the family in the Men’s, Women’s or Junior Divisions! The most sailfish caught and released determines the winners! Spring is in the air & Tarpon abound. We are still experiencing a great season and looking forward to a very busy April & May. Please make any dinner reservations 24 to 48 hours in advance. Please be considerate to your fellow members and make sure to have your parking/name card on your dashboard when you come to the club and park 3 deep pulling all the way forward. If you need a new name tag to put on your dashboard, please see me. Also know that we have overflow parking available north of the club at the Vernis & Bowling Building. Last year’s winners all received a free entry into this year’s event! Please register early, bring your friends and have a Bloody Mary on IFC. I am not sure if you are aware of the horrific disaster occurring throughout Florida’s Coastal areas since the polluted waters of Lake Okeechobee have been released into the Caloosahatchee and St Lucie Rivers. Florida Bay and the Everglades ecosystems are also on the verge of collapse and the reality needs to be urgently addressed. I hope you will join us and learn what is happening and how you can help before it is too late. Thank you to all equity members who voted in this past election. We have some new board members and we welcome them to the IFC Board of Directors. I would like to take this opportunity to invite All members to our annual Board of Directors Meeting on March 17th at 5pm This is an opportunity to meet your newly appointed officers, here the status of the club & have a brief overview of the past year. Now that it is high season, I would like to encourage all members to make your Dinner reservations at least 24 to 48 hours in advance. Please remember that we have limited window tables available & they are filled on a first come first serve basis. With our incredibly gorgeous weather, I encourage you to try our outdoor patio. 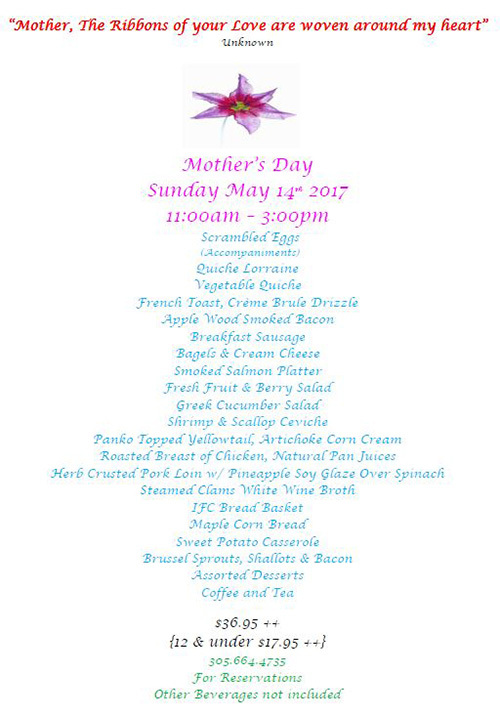 We will gratefully accept last minute reservations with time and space availability being considered. Please be considerate to your fellow members & make sure to have your parking/name card on your dashboard when you come to the club and park 3 deep pulling all the way forward. If you need a new name tag to put on your dashboard, please see me. We also have over flow parking north of the club at the Vernis & Bowling Building. Season is in full swing in Islamorada & here at the Club as well. I would like to encourage all members to make your Dinner reservations a minimum of 24 hours in advance. 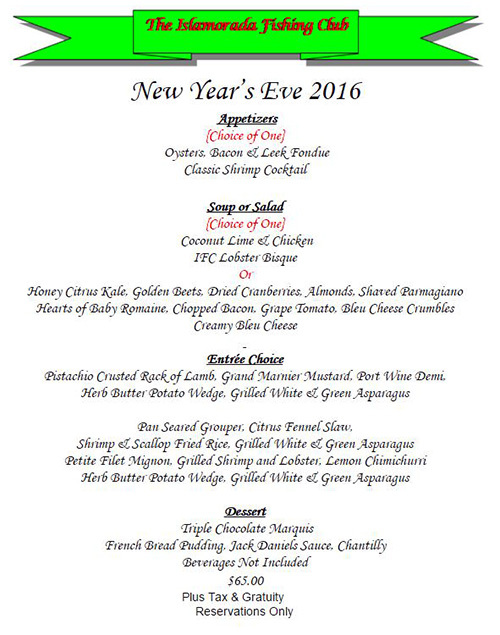 We will gratefully accept last minute reservations with time and space availability being considered. Members wishing to make arrangements for a private party or special event should contact me at the Club. Please be considerate to your fellow members & make sure to have your parking/name card on your dashboard when you come to the club and park 3 deep pulling all the way forward. It’s that time of year already. The 31st Annual Coastal Conservation Association Banquet & Auction invitation can be found below. 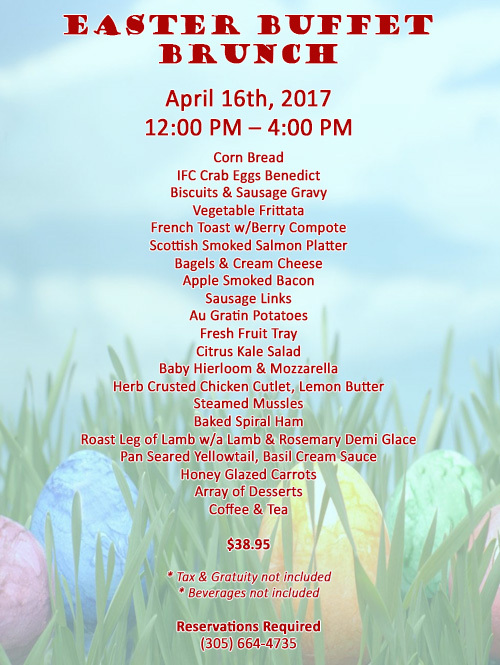 Please reserve your seat early, as we sold out last year and it looks like we will again this year. Feel free to contact me with any questions. Hope to see you there! $25,000.00 in cash plus prizes were awarded to Team One Up of Miami, winners of the 2016 Islamorada Fishing Clubs January Sailfish Tournament on January 21st with a field of 19 boats. “We were very happy with the attendance this year. There were 84 sailfish released in this one day event.” The awards that were presented was original Art by Jim Macmullen of Jimmy Mac Designs Winning trophies were presented to Anglers Rudy Espinosa SR, IFC member Doug Mientkiewicz, & Michelle Beltran with 8 releases on Time. Congratulations Art Fienberg! January’s Outstanding Catch: 36” 19 lb. Snook on 25 lb. Test. 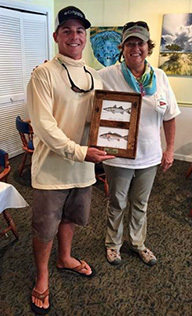 Art Was Fishing On The Tranquilizer V.
One Up Captain JC Cleare & His Mate Ryan were also awarded custom original trophies & a check for $25,000.00. Team One Up was also the winner of the 2016 Gold Cup Series with a combined 23 sailfish released on time. Last Dance fought their way into second place securing their spot also with 8 releases. Anglers IFC Member Eric Akins, Robert Helms & Matt Mclean were given 2nd Place Trophies. IFC Member Captain Robert Collins & mate Brandon took home trophies as well. Captain Travis Dickens with Mate Mike on The Indigenious released 7 sailfish on time to take home third place honors. Once again original art was presented to anglers Annie Corbeel, Wade Stafford & Phillip Brian. 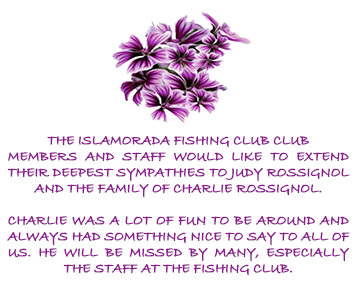 “The Islamorada Fishing Club outdid themselves this time. I would like to commend the entire staff for a job well done. Our anglers loved the food, drink and good time we had. 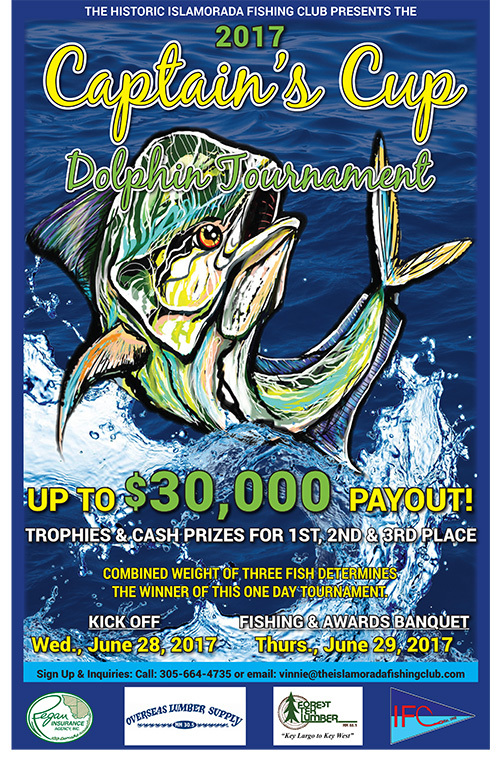 The next tournament in the fishing club’s series is the June Dolphin Tournament. 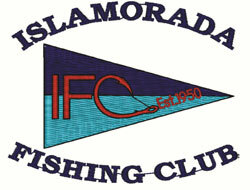 For more information on the Islamorada Fishing Club visit us online at: www.theislamoradafishingclub.com. Attention Captains, Anglers & Mates, Don’t miss your chance to win up to $25,000.00 in prize money! The Islamorada Fishing Clubs Sailfish Tournament kicks off on January 20th with fishing on January 21st. This is the final leg of the Gold Cup series and space is filling rapidly. So grab your fishing buddy and sign up today. This one day all release sailfish tournament is limited to 30 boats. With a full field the prize money may be increased to $30,000.00. 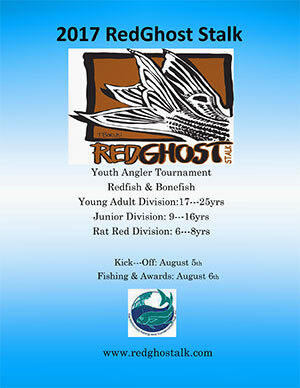 The tournament entry fee is $2,500.00 and $250.00 for a 3rd angler and includes 3 social ckets for each night. I hope that in this year to come, you make mistakes. Because if you are making mistakes, then you are making new things, trying new things, learning, living, pushing yourself, changing yourself, changing your world. You're doing things you've never done before, and more importantly, you’re Doing Something. I hope everyone had a wonderful holiday season!!! Now that season is here and with the Holidays behind us, we can all look forward to a Healthy, Happy and Prosperous New Year. The Staff and I would like to take this opportunity to thank the many members for their generous contributions to our Christmas Bonus Pool. Your generosity is deeply appreciated. It has been our pleasure to have served you this past year. TIS THE SEASON FOR SHARING AND GIVING! 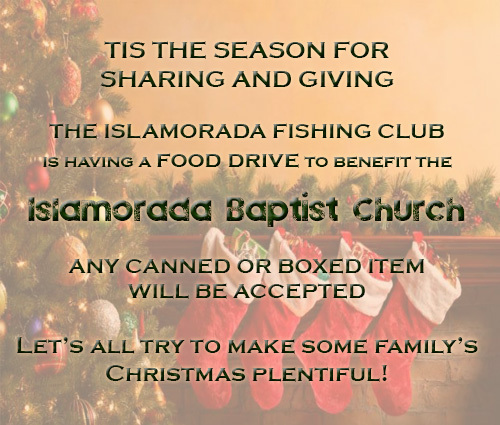 Food Drive To Benefit The Islamorada Baptist Church. Let’s all try to make some Family’s Christmas Plentiful! In this edition of Shortcast, you will find an enclosed bonus slip that allows you to show your appreciation to our 14 hard working employees. We will also have slips available in the Club. Your generosity means a great deal to our employees. Quite often it is your generous gesture that makes all the difference for the employees and their families during the Holidays. 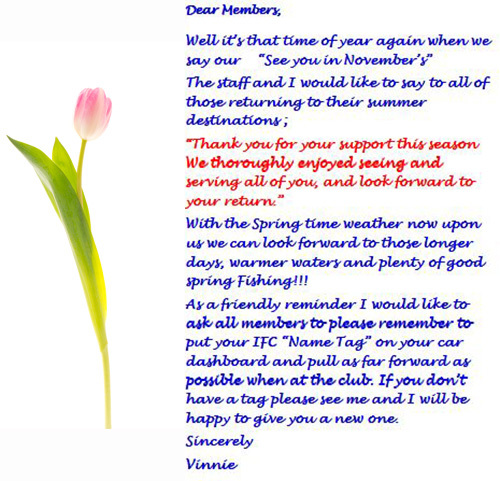 Please take a moment to fill out the bonus slip with your contribution, or, just simply e-mail the Club at vinnie@theislamoradafishingclub.com and we will debit your account. Thank you all for being so generous to our employees. They appreciate it! I wish you and yours a happy, safe and healthy holiday. The Holidays are right around the corner. 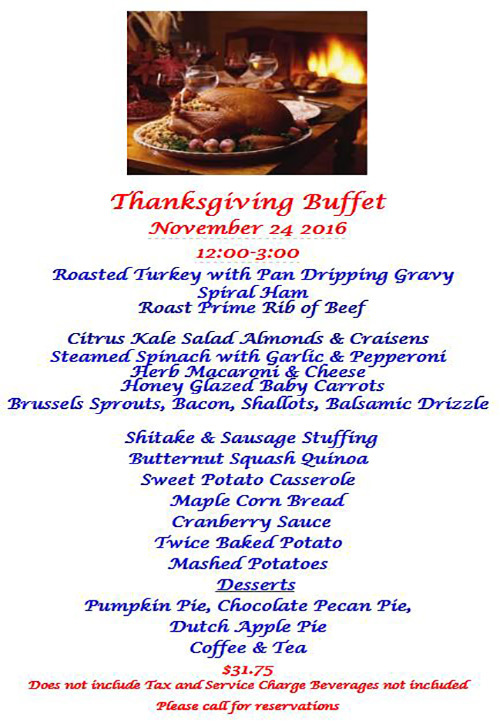 We will be open this Thanksgiving 2015 with a bounty of delectable offerings from 12:00 pm to 3:00 pm so please call us with your reservation. 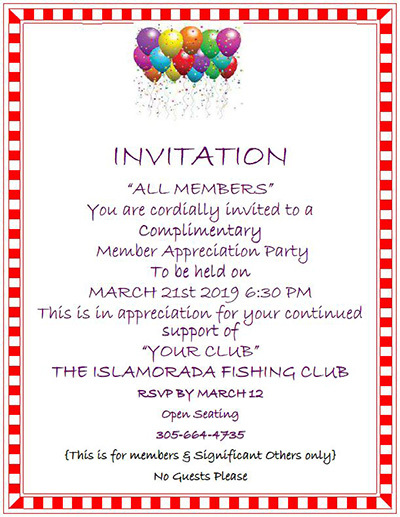 Don’t forget The Islamorada Fishing Club for your holiday party Please contact us to reserve your date and time for your family or company event. Come get a Signed copy and talk with the Author. Bob will be signing his latest book from 5:30 to 7:30 Wednesday 11/18. The proceeds from the sale of the book will benefit Project Healing Waters that supports veterans on their journey to physical, emotional and spiritual Health. Even though it was a blustery day, this year’s IFC Snook and Redfish Smack Down had some great anglers and some great fishing! Rob Preihs won overall Most Smack Downs with 13 combos of reds and snook! He also took home Most Snook Men at 13 and Most Reds Men with 16 fish. Linda Denkert won Most Snook Women with 8 and Most Reds Women with one red and that was on time. Completing the awards roster is Asher Cockerham with Most Snook Junior Division releasing 7 nice snook. Everyone enjoyed Chef Joseph’s wonderful barbeque and ribs after a long day of fishing. Look for next year’s IFC Snook and Redfish Smack Down coming in October 2016! Enter the family in the Men’s, Women’s or Junior Divisions! Islamorada Fishing Club's 1st annual Smack Down Tournament was a great success and a lot of fun was had by all. Congratulations to Mike Venezia - Most Smack Downs, Rick Moeller - Most Snook, and Chelsea Moeller - Most Snook & Redfish Womens division. 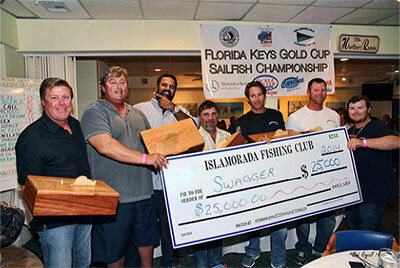 $25,000.00 in cash plus prizes were awarded to Team Swagger of Islamorada, winners of the Islamorada Fishing Club’s January Sailfish Tournament on January 23rd with a field of 20 boats. “We were very happy with the attendance this year. 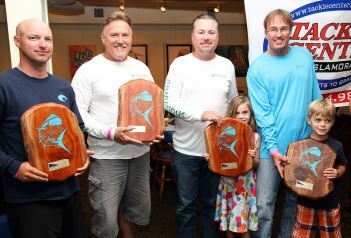 There were 64 sailfish released in this one day event.” The awards that were presented were original wood boxes topped with a sailfish by Doug Berry. Today, Florida's First District Court of Appeal issued an opinion upholding the net ban amendment...again. CCA Florida once again led the charge to support the Florida Fish and Wildlife Conservation Commission (FWC) regulations implementing the Constitutional Amendment that was passed by 72% of the voters in 1994. The same small group of commercial gill netters that have filed one lawsuit after another were rebuffed in the appellate court after finding a sympathetic judge at the circuit court level. The three judge appellate panel held that the trial judge, "...erred in determining [the netters] claims were not barred by [past legal precedent]". They also held that the judge was wrong to allow the gill net season to open while the case was pending in the appellate courts. "This is a big win for all recreational anglers and CCA Florida will continue to be the outspoken advocate and protector of the Constitutional Amendment which has protected Florida's marine fisheries and the multibillion dollar economic value of fisheries to Florida's economy," said CCA Florida Chairman, Fred Crabill. Last October, Florida waters were again open to the slaughter of illegal gill nets for six days, reminiscent of pre 1994 Florida where use of these nets devastated our near shore and inshore waters crushing recreational fishing for Redfish, Trout, Snook and other fishes. The net ban has had dramatic effect on bringing bait back to our near shore waters, with the resulting increase in catches of pelagics like sailfish and cobia along the coast.